A Class T amplifier is an audio amplifier IC design. Rather than being a separate “class” of amplifier, Class T is a registered trademark for Tripath’s amplifier technologies. It is an implementation of Class D amplifiers, but improves the control scheme to create more efficient and higher quality audio amplification. One of the amplifiers, the TA2020, was named one of the twenty-five chips that ‘shook the world” by the IEEE Spectrum magazine. The control signals in Class T amplifiers may be computed using digital signal processing or fully analog techniques. Currently available implementations use a loop similar to a higher order Delta-Sigma (ΔΣ) (or sigma-delta) modulator, with an internal digital clock to control the sampled comparator. The two key aspects of this topology are that (1), feedback is taken directly from the switching node rather than the filtered output, and (2), the higher order loop provides much higher loop gain at high audio frequencies than would be possible in a conventional single pole amplifier. Despite increased performance at a price similar to class D technology, financial difficulties have caused Tripath to file for Chapter 11 bankruptcy protection on 8 February 2007. 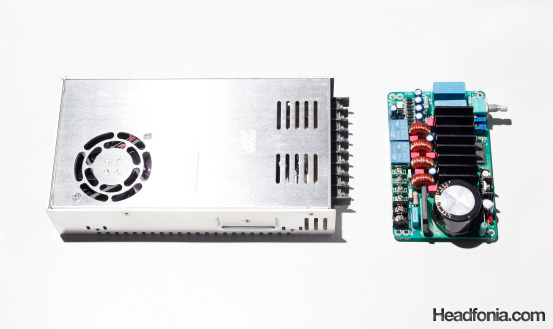 You can read more about the amplifier at the Hifimediy’s product page, as they do a fairly thorough explanation of the product page. But for now, we’re interested in how the Hifimediy TK2050 performs, especially with headphones. David brought the TK2050 to my place with the sole intention of trying it with the Hifiman HE-6, which is notoriously hard to drive. Of course, I’ve found that the production version of the HE-6 didn’t quite need a speaker amplifier, as it ran well on many headphone amplifiers such as the M-Stage and the Hifiman EF-5. But we always wanted to try out new things and find better alternatives, hence the TK2050. Previously, the only other speaker amplifier I’ve used with the HE-6 is the Nelson Pass designed Adcom GFA5802, which is a 300W power amplifier I use to drive my Apogee Slant 8 speakers. It sounds quite sweet, other than the high noise level due to the 300W power rating. But such a set up is definitely not very power efficient, and I don’t feel comfortable hooking up a headphone to a 300W power amplifier. The TK2050 board comes fully assembled from Hifimediy. It’s not quite ready to use yet, as you need to hook up an input connector and set up the power supply. Without much delay, I soldered some input cables with RCA terminals at the end. 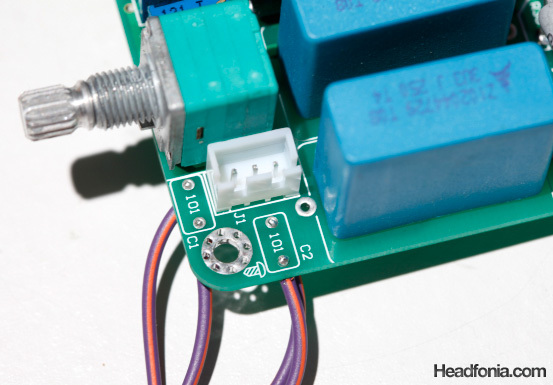 The output signal is delivered through the screw on connectors mounted on the PCB. The power supply we use is a Meanwell S-350, which is the recommended power supply for the TK2050. We adjusted the power supply for a 30V output. There are also two trimpots near to the potentiometer to adjust DC-Offset. We adjusted it to very close to 0 mV. Now, the important thing about the TK2050 is that you can’t short the output ground, meaning you have to reterminate your headphones with XLRs. Luckily, the HE-6 comes with balanced cables, and previously I’ve fabricated an XLR to bare wire adapter for use with speaker amplifiers. Additionally, I also have a balanced cable for the HD650 and the HD800, so we can use those headphones with the 100W Tripath as well. 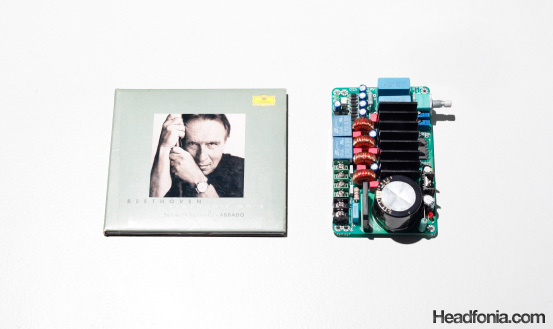 The TK2050 board next to a typical CD case. The TK2050 board with the Meanwell PSU. You can use header connectors on the input terminals (I soldered mine), and if Hifimediy can supply an RCA cable with the appropriate connector at the other end, that’ll make life a lot easier. You’d also need an XLR to bare wire cable to hook up your XLR-terminated headphones. Looks pretty ghetto, but sounds quite sweet. The 100W (at 4 Ohms) Tripath conveniently drives the HE-6 at around 11-12 O’clock on the volume knob. After all, the TK2050 is a speaker amplifier and should have little problems driving any headphones, no matter how inefficient, to ear-shattering loudness levels. The question then becomes, how does it sound? My previous experience of using speaker amps to drive the HE-6 was with the 300W Adcom, and one of the main issue with it is that its high noise level are quite audible when driving headphones. The TK2050, on the other hand is very clean sounding and zero noise. Instantly I notice that the sound is sweet and enjoyable. Some people say that class D amplifiers are harsh and cold sounding, but the TK2050 is none of those. There is no harshness, and the sound is far from cold. I also notice that the midrange is very special on the TK2050. There is a slight midrange boost, resulting in a slightly mid-centric sound, but it’s not extremely so. What’s more, it’s one of the sweetest sounding midrange I’ve heard from a non vacuum-tube amp. The synergy with the HE-6 is quite wonderful and it’s been the main amp that I use to drive the HE-6 with for the past few days since I’ve received it. All that power definitely has some merits, and the TK2050 feels so effortless in driving the HE-6 Orthodynamic, and likewise the Sennheiser HD650, which I’ve only experience driven so effortlessly on the Beta22. I’ve always felt that the EF-5 had sufficient power to drive the HE-6, but now that I’ve listened to it on the Tripath, I went back and felt that the EF-5 didn’t have the same effortlessness that I’m hearing out of the Tripath. The EF-5 also sounds less clean when compared to the Class-D TK2050. Driving the HD650, the sound feels just as effortless while the bass area no longer clumped together, and the HD650 truly sounds alive on this set up. This is amazing, of course, because it took me nothing short of the Beta22 to hear the HD650 sounds so alive. Of course the next question that I wanted to answer is, how close to the $2,000 balanced Beta22 can this $100 TK2050 get? Previously the Beta22 was the main amp that I use to drive the HD650 and the HE-6. Comparing the two, I can immediately notice the superior detail levels, soundstage, and frequency extension of the Beta22. So, perhaps I was being a little too enthusiastic over the TK2050. And yet, though the TK2050 falls short of the Beta22’s technicalities, its sound signature is definitely sweeter than the Beta22, especially with the sweet midrange that is bound to get a lot of people hooked. The TK2050 is not a slouch in technicalities, but it just can’t be compared to the Beta22. However, at a certain point there is just enough technicalities to please most music listeners, and the TK2050 has passed through that point. I actually wonder if it can be improved further by using a better power supply like the Sigma22, but the whole point of the TK2050 is how it is such a great sounding amplifier for less than $100. Perhaps the only catch to it being that it doesn’t come in a ready to use package. At the very least you would need to solder in the input connectors, set the voltage output on the power supply, and adjust the DC offset. All of this requires a small degree of DIY skills, but definitely much easier than say building a Cmoy. I’ve only spent a few days with the amplifier, so I apologize about the lack of depth in the article. I truly feel that the TK2050 is a special amp, and I just want to get the word out there. However, feel free to ask any questions you may have in the comments section, and I’ll try to answer it since the amplifier will stay at my place for a little while. The TK2050 amplifier sells for $38, and the Meanwell PSU for $41, both from Hifimediy.com. I was thinking about the same thing as well. These would be very sweet if they can put it in a case and sell it ready to use. Old article / thread here, I know. But I still have to ask some opinions / recommendations regarding these t-amps. Hifimediy now offers T1 also as a more special headphone version. I have HD600 phones and was just thinking if I would get this and use it both for speaker and headphones. Do you happen to have any clue if it would make sense to do that by just integrating a selector switch before output terminals? I will also ask this directly from Hifimediy. The T2 (the one featured here) now comes with better quality coils than the one I have. That should give an audible improvement in sound. There is also a T1 version which is optimized for higher impedances (the T2 is for 4 and 8 ohms). Lastly, you can also use batteries instead of the Meanwell PSU (2x12V or 24V) for cleaner power. Could you please advise on the dc offset,what needs to be done. If you look at the top view of the amp, on the lower right corner, next to the potentiometer, there are two blue blocks with tiny gold screws. Those are the trimpots that you use to adjust the DC offset. Measure the DC voltage from output signal to ground (L+ to L ground, R+ to R ground), and adjust the trimpot so that you get 0.0 mVolts or close to that. A few milivolts off is fine, just stay below 20mV. What is the ground on the circuit. I also tried soldering the XLR,hardest damn thing,did you solder it yourself. Any suggestions on simplest way,I'am using a no lead solder, would that be the case it is difficult. Kunal, you can tap the ground on the output terminals. Soldering is a little tricky if you're not used to it. Try buying several cheap connectors and cables and practicing on those. BEWARE: there is no output ground available… the output is L+/L- and R+/R-, because the power chip (TP2050) is bridged tied already. Could either Mike or Kunal give me an idiots guide to wiring up the xlr cables please? You need to use two XLRs, one for the Right channel and one for the Left channel. How can a $100 amp be so much better than, let's say, the so decried $200 xonar essence ST/X to drive the so needy HD650 to its very high performance (i.e. to the point where the HD650 is worth listening, not congested and slow) and even coming close to its optimal perfomance with the $2000 beta22 costing… 10 times more ??? How is this possible ? I don't understand at all because on the Sennheisers page, you said to somebody in the comments that the xonar essence was "ok" but definitly far from driving the HD650 optimally to its fullest quality like a beta22 or ZanaDeux would do. And i don't believe you would follow any hype on this tk2050 so you're being serious. I mean, to be honest i'm not a xonar fanboy i don't even own it and when i read anywhere ignorant fanboys claiming that the xonar can beat some DAC/amps costing 10 times more (without even trying) i laugh always. Though it surely can give a "good" sound to the HD650 compared to any onboard card. So how the f*** would this TK2050 costing half the price be able to drive the HD650s so much better than the xonar, and MOREOVER close to what we can get with beta22 costing 10 times more ??? I'm confused. Thanks in advance for your answer, i always appreciate to read them. I'll follow up with a question that could be an answer. Could it be because it is a speaker amp and not a headphone amp? Dave, which $2-$3K amps are built upon the Tripaths? It seems quite decent, especially for 4 USD. The T2 board comes with PSU parts in it and supposed to be feed with AC voltage. Just that some people at DIYAudio then found that feeding regulated SMPS is quite a simple, cheap but good match for this board..
"which $2-$3K amps are built upon the Tripaths?" Does the Red Win Audio 30.2 count as a $3k amp? If so then it is one example. Interesting, wwenze. I went to check out the RWA's 30.2's product page and they does mention a combination of vacuum and solid state, but they barely mention the actual circuitry on the solid state. The small pot on the T2 isn't going to be as good as the Alps Blue on the T1, yes. I just happen to have the T2, but it'll be interesting to see how much better the T1 can be. There is quite a lot of Tripaths out there. Doesn't one comment at the diyaudio thread mention that this TA2050 to be better than another TA2020-based circuit? The TA2050 just have alot more power you dont need. I have a TA2020 amp for my speaker and its more than loud enough. The T1 will suit ,as T1 is supposed to be more refined. Yesterday me and Hadi used the TK2050 amplifier to drive a Stax Lambda through an SRD-7 energizer (http://headfonia.com/stax-srd-7/). And the result was great. The TK2050 really had a nice sound, and we can feel the sweet midrange of the TK2050 amp adding some needed midrange body on the Lambda. The sound was very natural, very good. Just to add on this. I'm satisfied with the SRD-7 + SR-Lambda combo. It adds a really sweet midrange to the Lambda without the grain that comes with many other power amps. I don't think the combo is as clean as the SRM-1/MK2, but the TK2050 has a really good synergy with the Lambda+SRD-7. I didn't get the chance to listen carefully the soundstage, bass, and treble performance though. Nothing sounds unnatural, which is a good sign. Yea, I'm actually very impressed with the Lambda on that set up. Hi, I'm Steinar (aka nick122147) the distributor of these amps. Thanks for the attention on the amps. I am just a regular guy living in Shanghai China and I discovered the T2 amp here earlier this year. After writing about it on diyaudio.com I ended up as the manufactory's international agent. It's kind of a hobby, but fun to sell something I think is really good. I haven't thought of using it as a headphone amp before, but I see that this can work good! I previously also tried a tripath TA2020 amp (hlly 2020), which delivers around 15W. My main speakers are around 99db/1W, so you would think that those 15W should be enough. However, the ta2020 sounded ok for its money, but it didn't blow me away like the tk2050 did. The TK2050 chipset consists of the TC2000 controller and the TP2050 output chip. However the tp2050 is out of stock, so we are using other output chips (with better specs). The TC2000 is determining the sound signature, and the output chip is only doing the work (on off amplification). The T2 amp uses 2 x sta505 chip in bridged configuration to get 2 x 100W @4ohm. The T1 amp uses 1 x (the more powerful) sta508 chip, not bridged configuration for 2x 80w@8ohm. The T1 pcb also have room for a bigger and better pot, the alps blue. I would think that the T1 is the best match for high ohm headphones. The T2 is good at driving speakers at 4 ohm. We also have the T3 with sta517B output chip, bridged, which produces 300W@4ohm. Other very similar amps to the hifimediy T1 and T2 are the Red Wine Audio signature 30.2 (very similar to T1 but with expensive input caps and battery PSU), the winsome labs "mouse" is similar to T2. 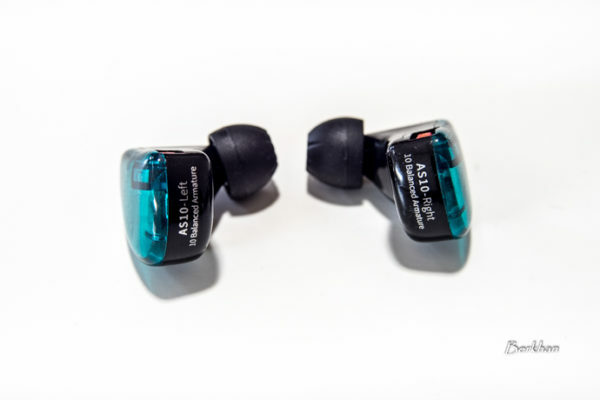 In high end audio, the component price and the sales price doesn't always have something in common, there are other aspects like marketing, research, design and profit that makes up the sales price. And it doesn't really matter how much the components costs if it sounds good! (except for when you are only paying for the components). The input caps is one of the simpler things to substitute, and there is almost no limit for how expensive ones you could apply. Although the technical guys argument that the industrial type caps (like the epcos currently used on the hifimediy amps) are better than the audiophile caps, they say the size matters, as small as possible is better for not picking up noise. However this a long discussion, and I haven't really picked side, I just experience myself that the mundorf mcap mkp provided slightly deeper soundstage and a bit less highs. I plan to make a batch with some other input caps, mundorf mcap mkp probably. I am also planning to making these pcb amps and the meanwell PSU into a finished product in one case, but the price point will be considerably more than these two parts by itself. 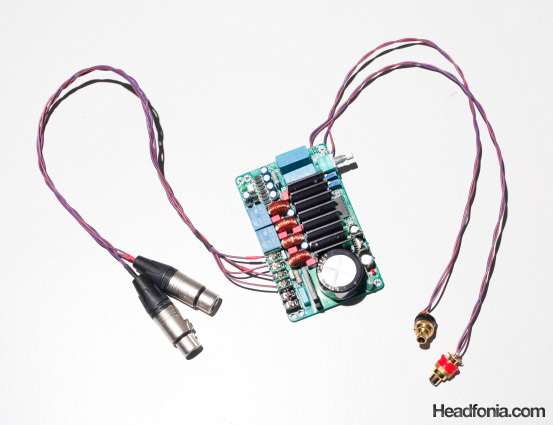 The interest on this site has also made me consider making a versions with xlr outputs for headphones. Thanks for the long and informative post, Steinar. I think there is quite an interest to see how the T1 pairs with headphones. It does work out of the same Meanwell power supply, right? Yep, and a T1 and a T2 (newer batch) is on the way to us. I like how things are coming together.. 🙂 Smaller PSUs, and a cased-up TK2050 sure will rock! Steinar took the -R, GND and -L connected to the T1 input directly… so this basically to coup with the inverted input on TC2000. Mike, you may want to try reverse the output cable that connect the amp output to your XLR connector. check what is the effect.., it should give a proper phase to the phone..
yes it should be possible, it might work better with some dacs than others. i have read about people doing it to cs4398 and ad4395 with good results. Some people prefer a transformer instead of caps, and some prefer a single tube stage (the lampizator is all about this). Anyway its much much simpler design than every commercially available dac. I have just talked the manufactor of the hifimediy amps to start making a prototype of a direct out dac! Very interesting progress!Let me test the prototypes! I'll try to reverse the input cable and see what the effect is. No! don’t inverse the input cable. Inverse the speaker connection to the female XLR. I'm not very familiar with the TC2000 and how you said it has an inverted input. I tried switching the output cable (signal to ground and ground to signal), and definitely the phase is incorrect that way. I tried to confirm it using the HD650 and the HD800, which I feel is better for testing these kind of things, using Horowitz Live in Moscow and Belafonte at Carnegie Hall. When the output is reversed, everything becomes forward, and the instruments are panned hard to the edges with no coherence in the soundstage. When I hooked the output the normal way (according to PCB) , the soundstage is back to normal. Vocal & back instruments take the appropriate place. usually on the speaker world, the reversed phase or out of phase would yield as soundstage collapsed or, sometimes more wierd, the stereo image is not projected in front of us but behind us… with headphones, I assume the effect would not be as dramatic… but it seems that you found the same phenomenon on headphones too..
so the T1 version would be safe to have single common output ground for both L and R channel? Yes, I'd like to know that as well. NO! still not possible. it's not possible on any tk2050 amp. actually, if we look at the STA508 datasheet, there's a recommended topology to implement it in un-bridged mode… But I guess, hifimediy still choose to use the STA508 on T1 in bridge configuration? What do you think about using Laptop adaptors, say in the range of 24-30 Volts to power these amps? To be using these amps for headphones, I believe laptop adaptors would suffice as long as they give enough juice for the amps to drive the phones. For speakers, I wouldn't recommend though. Edit: For Stax and any-harder-to-drive-headphones, I don't think the juice coming out of the laptop adaptor would be sufficient. I think we'll have to try it first. As hard as the HE-6 is, they are still far from a speaker. Also, I don't think that Stax headphones (at least the lambdas) are hard to drive. They just need the proper voltage. @David: do you think I can hook up an ampere meter to find out how much current the amplifier is consuming during operation? Will that work? I measured the current draw from the powersupply when running on 87db speakers. Between 130 and 180 mA average on normal volume. Almost nothing! I think peak power is much higher, but the pau caps would help with that. Another thing, I was using a DIY style DAC which is supposed to be very good. 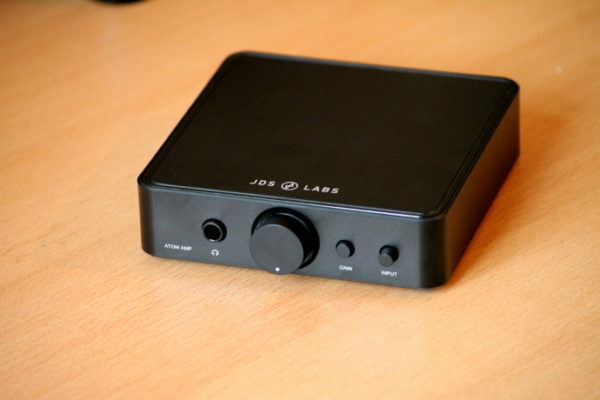 But when I did a mod to it, it open up and became a very different DAC, hugh difference. The only thing I did was to take the signal directly from the DAC chip cs4397, and into the amp, just via a pair of coupling caps. avoiding all the opamps, filters and circuitry on the DAC after the actual dac chip. It makes me wonder why no manufactors make a dac this way! i think it’s because it techincally incorrect. but the sound was 500% better. i kind of want to get the hifimediy manufactor to make this kind of dac also.. hehe. it would be cheap and simple also, only half the parts needed. Definitely there will be drops in quality with the Laptop PSU, but we can always test it to see how significant is the drop in quality. Otherwise it may be a practical alternative for the Meanwell PSU. That DAC + TK2050 amp sure is interesting. I've found that amplifiers cased on the same enclosure as the DAC (like some DAC+Headphone amp combos) sound very transparent due to the short signal path, lack of external connections and such. WOW, quite a news on ddx8001, Steinar…!!! no, Mike… with ddx8001, we don't need any DAC any longer…! Oh that sounds really really sweet! So all digital up until the final output stage? "The Wadia 151PowerDAC mini is a sophisticated combination of high performance DAC, surprisingly robust amplifier, and plenty of inputs for today’s digital sources. With a nod to Wadia's original Reference PowerDAC, the 151uses a scaled-down version of proprietary Wadia DigiMaster, and DirectConnect technologies for pristine reconstruction and amplification of all your digital sources. Convergence Wadia style. Four selectable digital inputs including USB, Toslink, and (2) coax S/PDIF provide plenty of opportunity to connect a computer, games, and streaming audio sources, as well as your iTransport. This high-resolution digital audio signal is modulated into a conservatively rated 50-watt/4ohm PWM output, and delivered to your loudspeakers using today’s most advanced digital amplification. The performance is truly astonishing." not sure what's the PowerDAC is… could be just a DAC + power amp in single box (so, this is like what Steinar mention with direct DAC to amp).. or .. the single digital processing like ddx8001 + power chips..
That would be nice, keep us posted. Steinar, when you take out the output directly from your DAC chip, which is CS4397, did you take it dual rail (differential) or single rail only? If it is single rail, did you use GND and NEGL and NEGR? I recall TC2000 input stage is actually inverted. I took it single rail and used GND. I'm going to get the T1 amp in Steinar, hopefully sometime next week. Will compare it to the T2 then. I'll also try to find a laptop adaptor to try out with these and see how it sounds. How come there are two Mikes here, who is who? The same Mike. I had to create a new username because the intensedebate platform requires another admin. So what is the best choice for such ridiculous prices between xonar (which you said was "ok") and TK2050 which you are saying is amazing (don't worry i've read the comparison with the beta22, i know you didnt say it was as good as beta22 of course, but still, you were much more positive about TK2050 than xonar to drive the HD650) if you want you can just skip the part of my comment about beta22 and just tell me how is it possible to say the xonar is only "ok" and definitly not optimal for HD650 when you say this TK2050 is very good for HD650 ? I mean, what are the main components in the TK2050 that arent in the xonar and makes it so much better for driving the HD650 ? Thanks in advance. The Xonar's headphone amplifier is based on Texas Instrument's TPA6120A2 chip. Where the TK2050 is based on the TC2000 and STA505 chip. Totally different technology there. It's like comparing processing speed on a $500 smartphone and a $500 desktop computer. Both has processors, but totally different speed based on what the devices are designed for. You should really try to tune the output filter, as its tuned to filter out high frequencies (like the 600khz+ switching frequency from the tc2000 chip), on about 4-8 ohms. I have asked the manufactor about this, and they say the T1 amp should be ok with headphones impedances also. 12V batteries would be the finest,I feel even Red Wine Audio recommends DC power. Well, battery power would be sweet, but I was talking to Steinar, and apparently the battery solution that he's using lasts "only" ~20 hours. While that is something that you can definitely use, I am not sure if anyone would be willing to go through the routine of charging a battery everytime you've finished listening to the amplifier. Imagine as if you have this little portable amplifier for earphones. Most of them lasts for less than 20 hours. I wouldn't mind having to keep charging the battery every 20 hours or so. 20 hours is a good number. What kind of battery was Steinar using by the way, and what's the specification? What are the options for charging? SLA battery charger with trickle charge, I guess. You can leave it charged all time, even while being used. I used to be listening to music in my car in the garage (engine is off), with the charger charging the SLA battery. How about linear power supply with low-ESR capacitor banks ? I think ultimately there are two kinds of solutions, one is for the people who wants a good sounding amp while keeping cost to the minimum, and the other for someone who's willing to spend a little bit more to get an even better sound. Being a semi-DIY project, I think it's open to all sorts of solutions. it is technically not possible, Frank… because the power chips are used in bridged (like push-pull) mode.. which do not tie directly to the ground. thus we cannot easily just connect both -R and -L together. I'am sure Gary would be able to terminate the cable to a 3-pin XLR. I got my T1 today, connected everything up and gave the HE-6 a listen,what to say,let ther be BASS. More impressions to soon follow. I'am using 2 12V SLA batteries. Your wish is my demand,please excuse the photos are using a mobile camera. My usual camera was not charged. The impressions so far, is this thing has BASS. I'am getting the same bass impact as my RS1i's,which is not bad for the HE-6, this bass has more character and extends lower. Previously with my audio-gd C-2 there was bass extension,but didn't have the dB. The rest of the frequency range has not changed much,I feel the T-amp brings the music more forward,therefore slight reduction in soundstage depth. I have to do more listening for further comments. Did you get the Meanwell PSU as well, or you're only listening with the batteries? I did ask Steiner about the duifferences, and he recommended the batteries over the Meanwell PSU, saying that the background was even darker.__We all know that battery power would always be superior,I would probably get 20 hours in a single charge which is nice. That is right I'am using speaker cables to connect the batteries,I don't see any harm with them considering the Current and voltages we are using.Put some light on that if you feel there is something wrong. Yes, from what I read, battery power is the best power. If only we can get battery power for our tube amps and Class-A solid states. 🙂 But in the case of the Tripath amps, it's very power efficient and that makes battery power accessible. I compared the Bass punch performance of the TK2050, driving the HE-6 to the 4ch Beta22 and Hifiman EF-5 amplifier. The Beta and the EF-5 is a tad more powerful still, but the TK2050 is still not bass shy, and definitely a very good buy for the price. I compared the Bass punch performance of the TK2050, driving the HE-6 to the 4ch Beta22 and Hifiman EF-5 amplifier. The Beta and the EF-5 is a tad more powerful in bass punch, but the TK2050 is still not bass shy, and definitely a very good buy for the price. What about the detail retrieval and the rest of the frequency range. The headphone amplifiers have better detail retrieval and frequency extension (especially the Beta22), but the TK2050 is far from sounding veiled or muddy either. And still the TK2050 is very musical and clean sounding. That is a shame that you find the B22 being superior then the TK2050,there are a few who have commented that the B22 synergy with HE-6 is not sounding ideal. I myself haven't heard it personally but will compare it soon. I have to agree the Beta22 is not the best pairing with the HE-6. I was just commenting the bass performance, technicalities, and detail retrieval. The Beta22 is the most technically capable amp I've come across, but that has nothing to do with actual synergy. The T1 is quite noticeably the better amplifier. Better low level detail, better frequency extension top and bottom, more spacious soundstage. Sound signature is quite identical except the T2 is a tad more forward and more focused, which may be due to the smaller soundstage. I am not sure if the difference is due to the slightly different design, or if it's mostly due to the ALPS blue pot. If you're getting this for headphones duty, go with the T1 ALPS blue! Testing it with the HD800, HD650, and HE-6, I find the amplifier to sound very good with all three headphones. It's very special with the HD650 and the HE-6 though. I think the HD800 needs a more high end amplifier to flex its muscles. It's very effortless in driving all three headphones, and certainly one of the best pairing I've heard with the HD650. With the Grace m902 DAC, the HD650 really sings out of this amp. It doesn't feel slow and heavy anymore. With the HRT DAC, the bass areas are not quite as quick as with the Grace, a very significant change that contributes to the overall slowness feel. I hope Hifimediy can sell this as a ready-to-use package, as it definitely is one of the best sounding amps I've heard, and for a minimal budget as well. Abundant power even for the HE-6. Very good frequency balance with very special midrange that is smooth and clean. Overall very musical sound. I can't find anything to complain about. Well, I can find shortcomings in the detail level and other technicalities, but I'm comparing it with a 4-ch B22! This amp drives the HD650 better than the Matrix M-Stage and the Hifiman EF-5 and even the Meier Concerto! And I'm not even listening out of a battery power supply like Kunal's set up. I will case it up, after a few weeks, but it sort of makes the amp expensive with all that dressing. That is right,but you know the DIY bug is slowly growing inside me. These are exciting times,mainly becuase we are getting performance out of DIY amps for a fraction of price often paid for audiophile quality hi-fi amps. HE-6 is to be driven from a speaker amp,which one.This is a question which will be answered in due time as there are literally hundreds of options specially with speaker amps. Mike, you will enjoy powering the T1 with 24V battery supply. Yes, I've seen those vintage receivers around.. Teac, Marantz, Sansui, Nad and so on. About 60-70 watt output.. while they should have plenty of power, I don't know about the detail, technicalities, noise level and such. They're vintage designs, they're A/V receivers, and you don't know when they're going to break as they're roughly 20 years old or more. What wire did you make the speaker adapter from. I hope mine is fine,i purchased their most expensive 4 wire speaker cable.Seems like copper. I used the purple cable seen on the photos. It's a very good quality copper that none of us knows the brand. Lol. It's because the local store who sells it imports the cable from Japan and would not disclose the brand. I use it on my b22, interconnects, everything. That's good news Mike, I am also still considering the T1, mostly because it has the Alps pot. But on the Hifimediy's site I read there are some issues with the T1 regarding powering on/off the unit, I think. Did you encounter any issues? Yes, Steinar did warn me about the power switch issue. so far I just keep the switch always on on, and I turn off the power by pulling the AC power cable. It's very power efficient, I've left it on the whole day and the heatsink is only moderately warm. The power issue is only when you exceed the 37v or 32 volts,not very sure, but if you use SLA batteries which provides 24V then there is no problem. Thanks, I'm not aware of that. I'm setting the meanwell at 30Volts at the moment, and haven't had any problem with the power switch. I need to get more head time with these headphones,so tempting to get lost in this amazing Ocean of beautiful music played my some of the most amazing orthodynamic headphones. I'm testing the TK2050 with the Sigma22 power supply (Beta22's psu) set at 30V. I don't know why, but there is a lot of detail lost, ambience is not as good, and so on. The Meanwell is definitely better. Gotta try some battery action with these. I'am sure you will be enjoy the battery power,what DAC are you using with the setup. Using mostly the Grace m902 set-up. I don't know, I haven't had the time to go shop for the appropriate battery.. I was just comparing some Eagles music with HE-6 and RS1i, the guitar seems to be so over-emphasized with the Grados that they almost sound un-natural,whereas the HE-6 may not have that mid bump but certainly plays them articulately. That does sound like a Grado RS1i. I don't think the RS1i can compare in the bass and most certainly the treble as well. For Christmas I really need an amp for my HD650's and I'm 13 (markmaxx gifted them to me, great head-fier) but I don't have any DIY skills. I have never even soldered anything in my life! could this get me started? Or should I do something else? Go for a full built amp? Thanks for sharing, Allen. It comes with a headphone jack too! That sounds awful. Wonder what happened there. The quality PCB on mine was very good and there was no channel imbalance with the ALPS blue pot. Are you running you HD650 straight from speaker outputs without some resistor network or something like that? Isn't that dangerous for the headphone? or was the T2? From your picture it seems like it's a version with the small CTR volume pot. 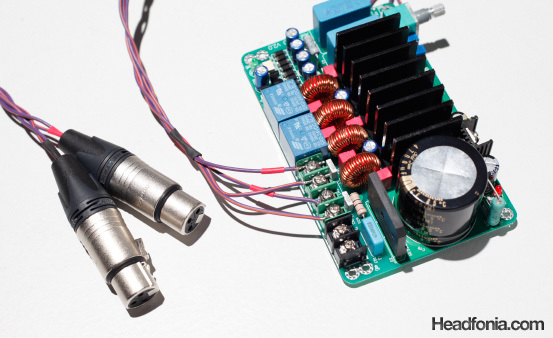 Yes, direct from the speaker out to the HD650 with balanced recabling. Remember that you can't use this with regular TRS jacks, as TRS jacks will join the ground on both channels. As long as you've done the DC-offset setting to 0mV, and as long as the volume control is there, I don't think you have to worry about anything. 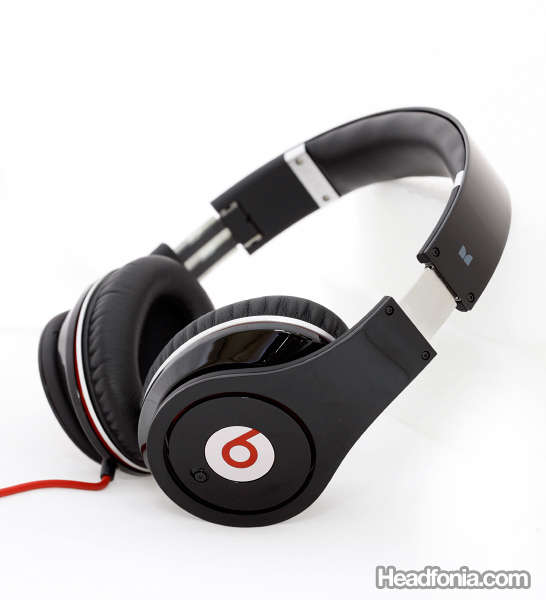 The power output is limited by the volume control and the impedance of the headphones. The review was with a T2 model, but later I received the T1 with ALPS which is significantly better in detail level and soundstage than the T1 ALPS. What I get with the Hifimediy amp is how the HD650 becomes a much more "alive" headphone than it was before. The HD650 is notorious of having a sense of "slowness" and laid back-ness in the sound. With this amp, the HD650 picks up quite a bit of pace and can play with faster-paced music better. In that sense, this was the second amplifier next to the Beta22 that was able to bring such a feeling of lightness to the HD650. Technically, the Beta22 is still pretty far ahead the TK2050. I understand now what you mean. However I expected better results technically from these Tripath amps. I listened to some of them, I still have a small Trends TA10 and I always believed that these are pretty detailed when I compared them to other speaker amps. If you're just talking technicalities, the Tripaths are a bit hard to compare with the regular headphone amps. They have a clean, grain free sound that say I can't get with the M-Stage, EF-5, or the Meier Concerto. I think it's a signature of the D-class design. However, talking detail wise, I didn't think that the Tripaths are that detailed, and soundstage performance is just allright, but the EF-5 is still better. On the other hand, none of those amps I mentioned can inject a feeling of power into the HD650 like the Tripaths can. Hi Mike, thank you for these detailed answers. who knows… headphone amps are just more transparent. Searching the forums I found that the input caps are pretty bad and need to be changed, this a nice example (Sonicaps) http://www.audiocircle.com/index.php?topic=84311…. It seems that pretty soon a new T4 with better parts and (maybe:)) better sound will be released. Last I would like to ask you a little advice. I was looking at the new HE6 but probably I won't afford at the moment an amp more expensive than EF5. Is this going to be a MAJOR upgrade compared to my "M-Stage like amp" + HD650? Or maybe I should just get a better amp for my HD650? Like the new Burson 160D? As absurd as this may sound, I still think that detail is not the number one thing when listening to music, and the TK2050 just happen to give a very good musical presentation, which for me is more important than detail level. Yes you can always play around with the input caps, I personally haven't done that. Lastly, I do think that the HE-6 with the TK2050 is quite an upgrade over the HD650 set up you now have. You should give it a try, the HE-6 is quite an amazing headphone. Have you tried it with the Sigma22 yet? I thought I've replied to your question on the S22.. Yes, I've tried it with the S22 (only using single rail). Surprisingly the sound is not as transparent and detailed as with the Meanwell. The sound really becomes muffled. I don't know what happened there, but I guess the comments about the Meanwell being a good pairing with the Tripaths are true! I can order some finished Tripath pcb’s through a Dutch forum. They are TA2020 and TA2024 though. Would these come in use for driving my Senn’s as well? Yea, I think they should be a good try. After all they are based on the same tripath technology chips. Yes.. Steinar told me about the new DACs, but I’m waiting for the cased-up version before doing a review on it. Hi, I´m looking for help about this amp. I got it in the summer for building a wireless audio system. I just started building and realized there might be something wrong with the amp. It just don´t give power, it sounds so low at full volume, more or less the same as if I just connect the iphone earphone output directly to the speaker. I use two 12 volt batteries in serie, so the give 24 volts. ( measured 25). I use two dayton rs100-4 driver speakers. I try with iphone earphones output for signal in, as well as some other phones but get same results. Anybody can think of any possible problem? Thanks.